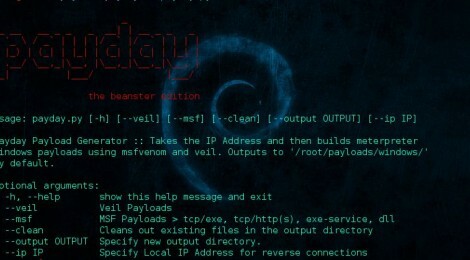 Browse: Home / payday v0.5 – Payload generator that uses Metasploit and Veil. + payday.py : Added Veil path as variable in main function and then pass this to other function calls. 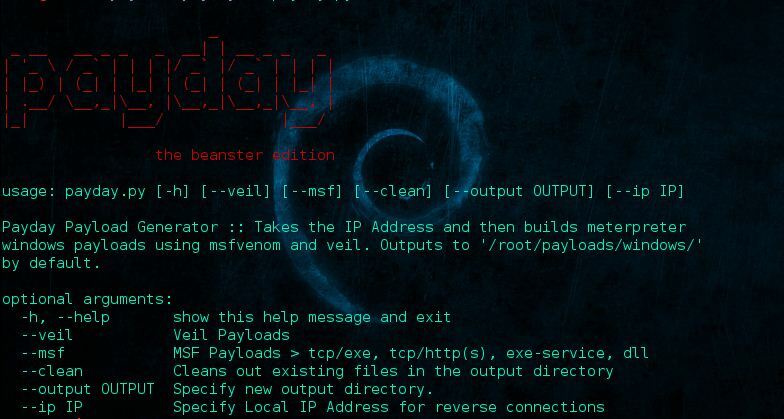 Payload generator that uses Metasploit and Veil. Takes IP address input and then builds payloads automatically. Calls Veil framework with supplied IP address and creates binaries and handlers. Uses msfvenom to create payloads and writes resource handler files in the same way that Veil does. version = "the kitchen sink edition"
handler = ext.split(".") + ".rc"
print "[!] Generated : " + yellowtxt(handler) + "\n\n"
""" Takes local IP address as LHOST parm and builds Veil payloads"""
""" Creates PHP based raw shell and outputs as txt ready for RFI """
""" Cleans out directory """
""" Builds directory structure if output option is supplied """
output_dir = output_dir + "/"
print "[!] IP address required with this payload option :: --veil --ip <Address>"
print "[!] IP address required with this payload option :: --msf --ip <Address>"
print "[!] IP address required with this payload option :: --php --ip <Address>"
← ATSCAN v9.5 stable – perl script for Search / Server / Site / Dork / Exploitation Scanner.